Botox is a muscle relaxant agent used to reduce and eliminate facial lines and wrinkles. The injection of Botox is both a science and an art, where only experienced professionals can achieve the finest results. We are located in Denver, Colorado and combine years of experience in providing advanced Botox treatments. Allergan is the original manufacturer and the pharmaceutical company that created Botox Cosmetic. 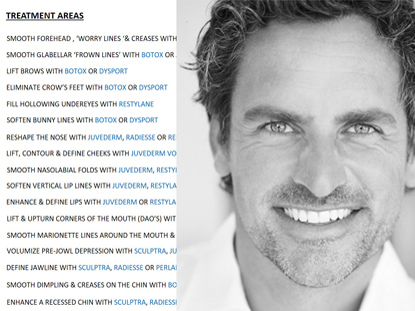 We are proud to source all of our Botox directly from Allergan. Additionally, because we want you to achieve optimal and long lasting results, we never dilute or alter our Botox from Allergan’s precise specifications. 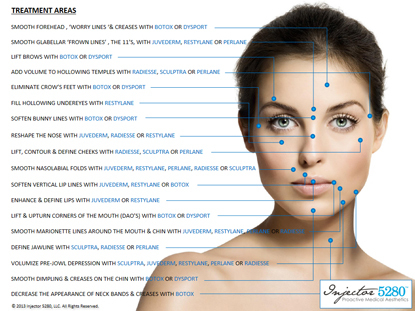 Which Areas can Botox be Administered? Reduces excessive underarm sweating – Hyperhidrosis. What Preparation is needed for Botox? To lessen the possibility of bruising after Botox, 10-12 days prior to receiving injectable treatments we recommend avoiding aspirin, St.John’s Wort, Omega 3, high doses of Vitamin E, and non-steroidal anti-inflammatories e.g. Aleve, Motrin, Advil, and Ibuprofen etc. If you take aspirin for medical purposes, please continue use. If you have recently suffered from facial cold sores please notify your Aesthetic Injector prior to receiving injections, and follow our recommended treatment plan. The treatment begins with collectively mapping out your customized treatment plan, reviewing post-care and answering all your questions and concerns. The injection process takes approximately 15-30 minutes and involves a series of small injections using a very fine needle into the muscle of the preferred treatment areas. Discomfort is usually minimal and very brief. There is very little, if any downtime or recovery needed. Refrain from exercise after Botox for at least 4 hours, or any strenuous activity that can cause a sweat. Additionally for 4 hours after treatment avoid lying completely flat, or engaging in activities where your head is below your heart. Do not rub or massage the treated areas so that the Botox can remain undisturbed. Botox injections, just like any other injection, can cause some bruising and swelling. We have some special techniques that we use to minimize the swelling and bruising associated with Botox injections. However, if bruising and swelling occur it will subside and fade in a few days. Some mild redness and tingling is normal after the procedure and should dissipate after a few hours. Make-up can be applied 15 minutes after treatment. If you experience any mild aching at the site of injection after the procedure this can easily be controlled with Tylenol. Muscles have ‘muscle memory’ and for many people, tight is the normal state of their facial muscles. Botox is very effective at retraining muscle memory. Through multiple Botox treatments, facial muscles can eventually forget their previous tight state. Instead, a more relaxed and smooth state can become the patient’s new normal. Proactive and regular maintenance is therefore key to achieving optimal results. Excessive underarm sweating, known as Hyperhidrosis, is a very common issue and can be easily and effectively treated with Botox.